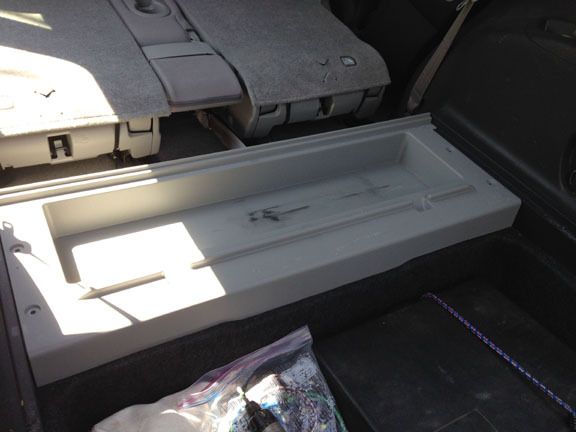 My rav4 has two storage areas under the floor, and the one closest to the back seats is a plastic "box" with 4 screws. I suspect a mouse has stored some acorns under it, and want to remove it to clean it out. I removed the 4 screws on the top, but it won't budge. What's the trick? Also, if anyone has knowledge of a good repellent, I would appreciate it. Thanks. You pull very hard and it will come off. There are clips under that box anchoring it down which is the same types used on all the door panels. I think I may have tried using a flat pry bar. Yep, a flat pry bar or just pull hard with gloves on so you don't cut your hands on the plastic edges. Thanks to both of you for responding. Once I knew it was ok to pull it up, I tried it by hand, and it came up easily, and I was able to vacuum it out. Glad that you were able to remove the box with advice from this great forum. As for a repellent...try Bounce/Fleecy sheets....smells better than mothballs and works well. Thanks for the advice on the repellent. The problem with bounce is that I can't stand the smell. I tried it with my previous car, and I had to take it out - too strong! So, I got a repellent made from peppermint and spearment leaves mixed with, of all things, corn cob pieces, which I would think would attract them, but hopefully not! Hopefully the mint will work, although I guess I'll have to replace it about every month. If it works it will be worth it.